Last week, we reported that we had resighted Raphael, but that he (Raphael's tail is getting suspiciously long) had what appeared to be white rings around his neck and all four appendages. Raphael has since let us get as close as we wanted for as long as we wanted, and we now have excellent video of this affliction. It is some kind of parasite. We're calling them "Clingons" until we are sure of a scientific name. So far, we've documented six other turtles who seem to have the same problem. Three of them did not have this parasite last summer. Unfortunately, at a distance this stuff looks a lot like pre-eruptive FP tumors (we refer to that as "salt and pepper") so normal range video can't tell whether we have the harbinger of FP or very early "Clingons" instead. It's certainly going to complicate our lives. This is what "Clingons" look like up close. This shot is of the abdominal region, left hind flipper area. This is what "Clingons" look like up close. The camera was about two inches from Raphael--any closer and we'd have had the shadow of the camera blocking out light. Viewing it gives us the creeps. In video, you can see all these "mouths" opening and shutting... like something out of the X Files. 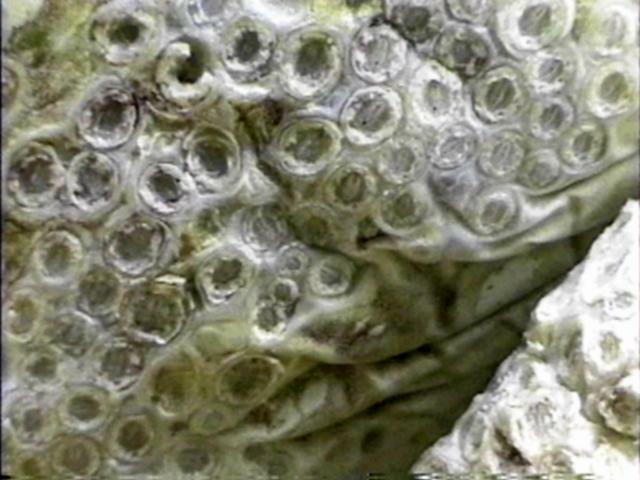 Each individual animal is about 7-10 mm across. We've watched cleaning fishes. Aside from a cursory probe by a C. jactator, nothing else will touch these things, so Raphael's on his own trying to rid himself of them. Been diving with a slightly sprained ankle for two days and had to icepack it much of last night. South swell in today and I figured might as well rest my foot. Ocean died down enough by midday to tempt me to do one dive. I didn't bring my camera though, too tough to drag and carry. Figured I'd do a census of the number and type of cleaning fishes instead--boring but a lot easier on an ankle than dragging a camera and flash! Well, on the way back to shore, I was preoccupied counting the number of C. jactators along a section of reef when this sweet little honu with a #3 (large) mouth tumor swam out from under her ledge (seen her several times before but she'd always shy away). We met head on... me headdown counting fishes and her headup going for air. She stopped and we exchanged looks. I felt sorry for her--that large tumor on such a small honu meant this'd likely be her last year. Then behind her another larger turtle entered my field of vision. 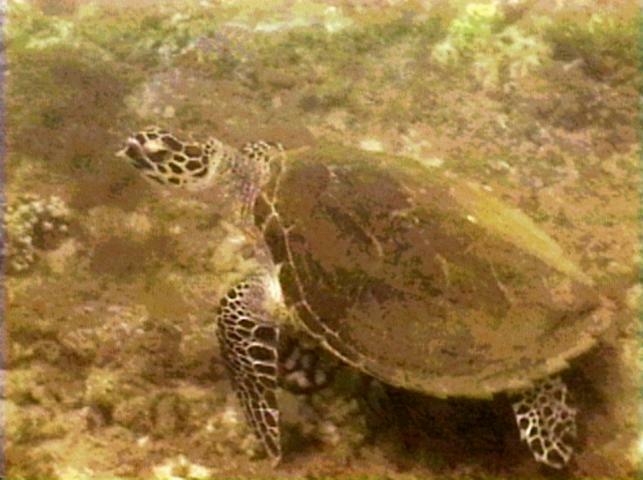 It swam towards us inspecting the tumored honu. It was my very first look at a Hawaiian hawksbill. She has an algae covered shell that suggests it's a turtle from around here... we'd heard from fellow divers there was a hawksbill at Airport Beach (about a mile away). Now we believe them! Last three days we had "reversa-currents" meaning the current is running from Airport Beach to Kapalua instead of the normal other way 'round. Guess perhaps that's what brought this special visitor. Beautiful, parrot-like--a bird wearing a shell--and while the honu look back at you with graceful calm, a Hawaiian hawksbill is all comical surprise. Cool cool beastie--the very first endangered species I've seen in the wild. We've already "trapped" his left profile and added it to our database. We're calling the hawksbill Keoki (Hawaiian for "George"). Always wanted to name a honu that but around here practically all come down with fibropapilloma so there was no point, but this hawksbill has a decent chance and now that we've laid eyes on this wow...it was beautiful...creature, I hope we never see it around here again. It's not good to be a turtle hanging around Honokowai. Saw a loggerhead here in 95--the only time neither Peter nor I had packed a camera, so we couldn't prove it. But here, boys and girls, is Keoki, sighted at 2:50 pm at Honokowai, West Maui. Only about a dozen nesting on all of Maui. Somekindofwonderfulhuh?